A stage too difficult for some sprinters, but maybe not all. Lumpy! The main issue for a lot of the quicks is the fact we have four categorised climbs in the final 60km, which makes life very difficult for them. You couldn’t say these climbs are overly difficult, but they will start to seriously hurt the legs. The finale kicks off with Côte de Trevès, 2.5km at 5.7%. Up next is Côte de Condrieu, 4.9km at 5%. This takes us to the lap circuit and we’ll see a slimmed down bunch as we approach the final climbs. Côte de Saint-Michel-sur-Rhône is a longer climb, around 9.4km at 3.3%, but has a 2.5km stretch at 6.6%. After a fast descent, we begin the difficult final 11km of the stage, which can be split into two climbs. First up is 2km at 7%. 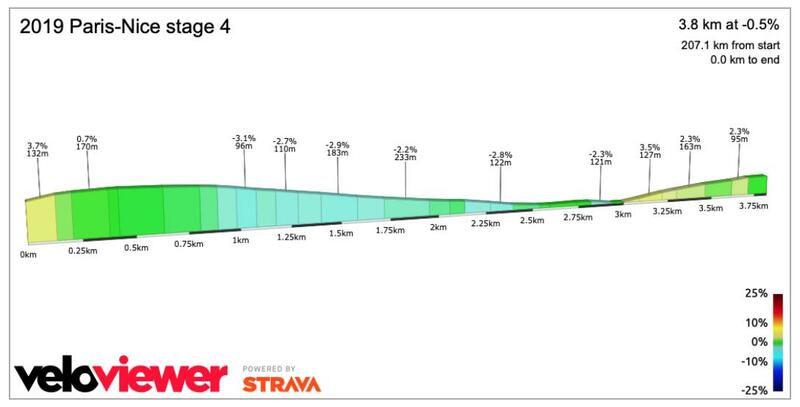 The road then flattens a little and we have 4km at 1.5%, before 3km at 3%, which you can see below. This crests with just under 4km remaining, the riders then face a short descent before the final kilometre rises up at 2%. Positioning for the final kilometre is going to be very important, with the double bend coming so close to the finishing line. We might not have crazy gradients, but this is a tough finish for the sprinters. After a tough couple of days, I think this finish will be harder than expected. The tough finish gives the breakaway a chance of success. Which of the teams want to control the stage? Jumbo-Visma won’t be chasing, Groenewegen will not make the finish. That means it will likely be over to Sky and Astana to keep the break close, but they should get help from Mitchelton-Scott. After his win today, we might even see Bora commit to the chase, as Bennett can handle some climbs. I think we’ll see these teams set a fast pace on the final climbs to stop riders from attacking. 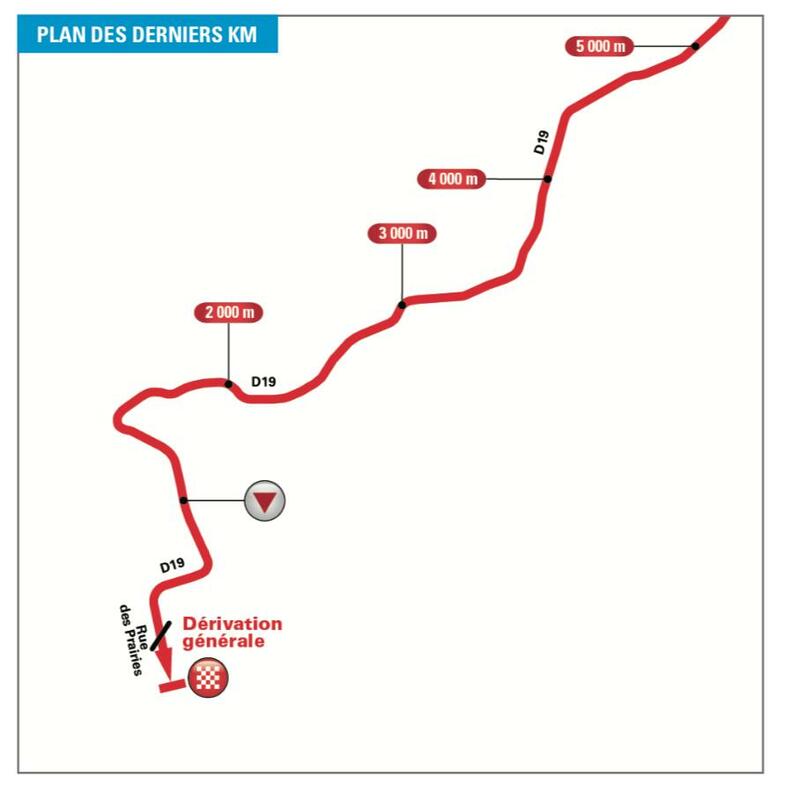 With the likes of Gilbert around, these teams will have to be very careful about leaving domestiques for the closing kilometres. Again, the wind is quite strong, but will be a tailwind for the majority of the day. 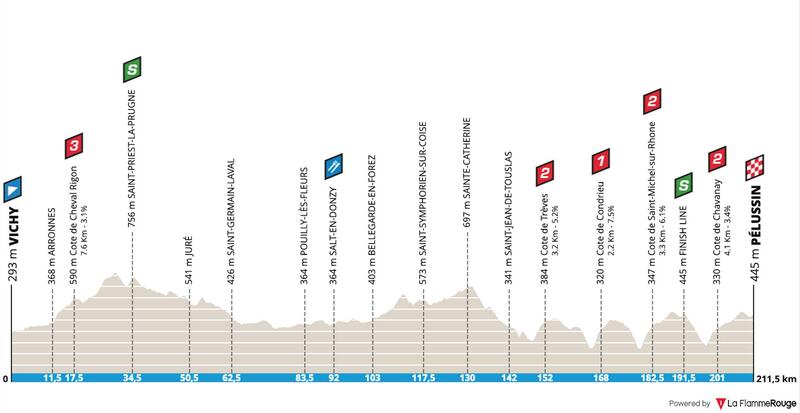 There is a point when the race heads east, where echelons can happen, but I don’t think we’ll see any splits. Matteo Trentin – the Italian is in amazing current form, particularly in the climbing department. Without a real contender for the GC, Haig is top 10 at best, Mitchelton-Scott can afford to throw all their resources around Trentin. If they want to set up a sprint, they’ll need to commit men at the start of the stage, but they’ll also need some for the final 20km. Having a rider like Simon Yates will be very important, he’ll do the work of three men in the closing kilometres. Sam Bennett – 211km and 3124m of climbing. Bennett has the best chance of all the sprinters, but it’s probably too much of an ask, especially after the opening three days. Philippe Gilbert – he’s been looking good in the opening stages, that must worry the other teams. If Trentin is still in the bunch, expect to see the former world champion attack on the final climb. He tried a late attack in the opening stage, we’ll probably get another one in this stage. Can he hold off the bunch? Michal Kwiatkowski – the Sky man has been hovering up bonus seconds, something he’ll try and continue in this stage. Okay, he’s very unlikely to beat Trentin in a sprint, but he’ll be happy taking 2nd or 3rd. The Pole has looked in menacing form, no doubt Team Sky will want to control the stage and dominate the way only they know how. Luis León Sánchez – another rider who has impressed in the opening stages. The Spaniard is unlikely to be viewed as a proper GC contender, that could allow him a little freedom in the closing stages. Saying that, Team Sky will want to be in yellow at the end of the stage, that means Sánchez will likely have to take his chances in the sprint. Sonny Colbrelli – the Italian hasn’t really been on the top of his game this week. I would normally expect him to survive the climbs, but something is telling me his form isn’t quite where it should be. Thomas De Gendt – if anyone can win from the break, De Gendt can. The start of the stage is uphill, perfect news for the Belgian. Matteo Trentin, all day long.